Yet another softball season draws closer to its end and once again, it seems that the Jackets have struggled competing away from home. While homesickness has cost them, Tech has still carried some of the momentum they developed last season onto the field this year. The Jackets got off to a rough start, beginning the season far from home at the Puerto Rico Tournament and coming home with a single victory out of six match-ups. With nearly half the line-up in their debut season, some growing pains were to be expected. Having more home games in the schedule than last year alleviated some of the pressure on the ten freshmen, who could focus better in the comfort of friendly confines. However, it has not been enough to prevent road struggles from affecting Tech’s standings. More than half of the games the Jackets have played out of state have been losses. With only two victories out of eleven match-ups away from home this season, hope for a chance at post season championship competition is running low. There is no time to rest and certainly none to concede defeat, but the chances of putting up a fight in ACC play are waning for Tech softball. Second in the ACC, Boston College will be the hardest match-up left in the season for Tech. The eagles will also be Tech’s chance to turn around the season and prove themselves as ACC competitors. It’s been two years since the jackets competed in an ACC championship and the jackets will leave everything on the field in their end of season scramble for a chance at a championship spot. The Jackets are well-versed in the art of the last-minute scramble this season. Nevertheless, if Tech hopes to turn a chance at ACC championship competition into an ACC championship title, the jackets will need to bring more consistency onto the field in their three final games than they have all season. Last-ditch efforts have not been enough to reverse Tech’s consistent difficulty reaching home plate this season. After a dismal start to the year, Tech rallied in the fifth inning of their second game against FSU. The scoreboard read 8-0 when the Jackets walked on to offer a final effort. Tech loaded the bases and earned three runs in the fifth inning and four more in the sixth. In the seventh inning, Tech had little difficulty reaching base, but its push fell short just before home plate, only earning one run. All eight of the runs tallied by the team were earned by different athletes. Tech illustrated great talent throughout the lineup through the last three innings of the game, but the team was nonetheless unable to scrap together a sufficient performance to carry it to victory over the ‘Noles. The Jackets carried that poor luck into their third game of the weekend and left Tallahassee with three losses. After going 4-5 against their next three ACC opponents, Notre Dame, Syracuse, and Virginia Tech, the Jackets got another chance to bring out a miracle victory at the last minute against North Carolina State. In its ninth extra-inning game this season, the team had no intention of submitting to defeat. Straight zeros lined the board for the first six innings before the Jackets picked themselves up in the seventh inning. Tech ended the drought with three runs on four hits in the seventh, tying the score with the Wolfpack and earning an extra chance at gaining an edge. The teams traded runs in the eighth and ninth innings, but the Jackets gained the edge in the tenth inning. The team outhit NC State 14-4, and junior Emily Anderson demonstrated tremendous skill on the mound through all ten innings. Consistent hitting and pitching secured the first victory of the weekend, but without consistent movement around the bases, the Jackets would be unable to rally through the next two games of the weekend. Pushed by their victory, Tech kicked off the second game with a remarkable seven runs in the first inning. By the fourth inning, the jackets had lost their momentum. They played through the last three innings with only two hits and no runs. A small rally in the last half of the game could have compensated for poor pitching earlier in the contest. Game three was plagued by the same inability to move from base to base. Outhitting the Wolfpack for the second time out of three games, the jackets failed to earn a run through all seven innings, extraordinary considering their hitting. 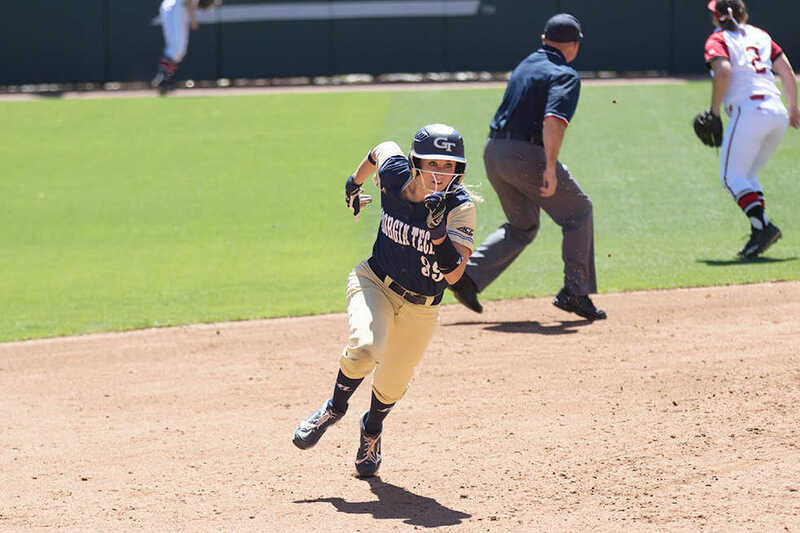 The Jackets will need to muster consistency through every inning if they are going to have a chance at earning a victory against Boston College. The team will get to practice putting together two good halves against Virginia before travel to Massachusetts to compete for their chance at an ACC championship spot. If Tech can manage to play through all six innings with the same ferocity that they played in the last half of their first game against North Carolina State; they could turn around the season in a single game, a truly momentous event. Tremendous skill is present through the entire lineup. Two experienced pitchers, and seven returning players, who have demonstrated raw strength at bat, welcomed ten talented freshmen to the lineup. Growing pains can be an issue every season, but with the level of skill that each player brings to the field individually, Those pains should soon ebb, at least in time for next season.